Interstate 76 (Schuylkill Expressway) is the primary highway connecting the City of Philadelphia to its north-western suburbs through Philadelphia and Montgomery Counties. I-76 plays a vital role in the economy of the Region and Commonwealth overall, as well as area business health and the quality of life of nearby residents. This roadway experiences frequent congestion due to traffic volume, crashes, weather, and routine maintenance activities. Commuters on I-76, as well as nearby roads are affected daily throughout the year by this recurrent congestion. The section of I-76 we are looking at, completed between 1951 and 1960, was designed to hold 35,000 vehicles per day. In 2017, I-76 carried more than 130,000 vehicles a day in Montgomery County with this daily volume growing to 211,000 vehicles in Philadelphia. Additionally, the arterial corridors near and parallel to I-76 carry an additional 230,000 vehicles per day. This is a 73 percent increase in capacity of the originally intended size for the corridor, and it continues to grow year after year. Considering that I-76’s width is restricted by the Schuylkill River, railroad facilities, industrial complexes, and the steep slopes alongside the eastbound lanes in Montgomery County, conventional options for adding capacity have challenged engineers and planners seeking solutions since the highway first opened. Technology and innovative strategies used and proven elsewhere in the U.S. and the world provide new tools to mitigate major traffic and safety impacts along I-76. 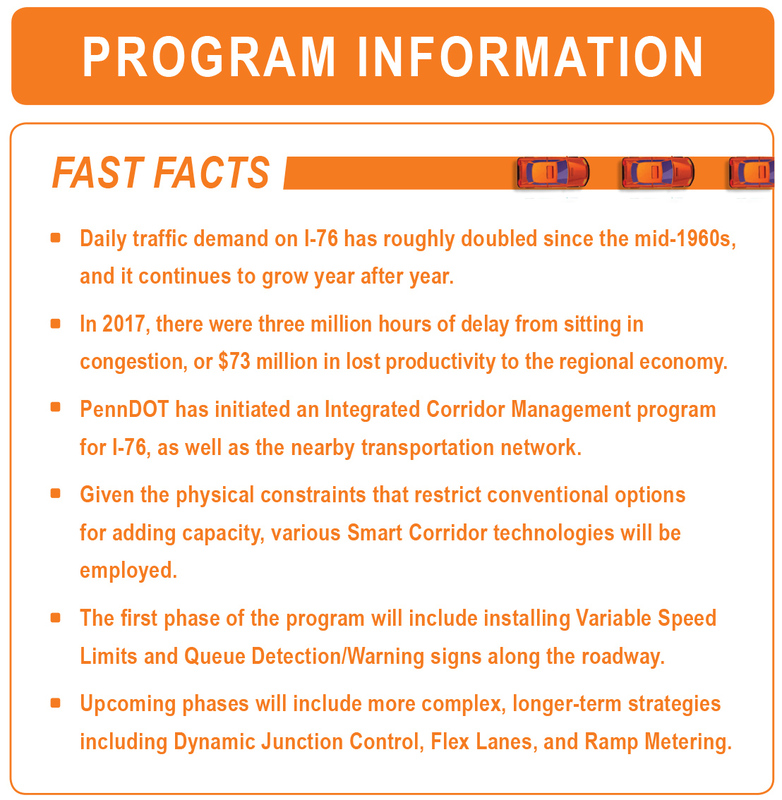 PennDOT has initiated an Integrated Corridor Management (ICM) program for I-76, as well as the nearby transportation network. Given the physical constraints that restrict the ability to add capacity, the program team is designing for and implementing various Smart Corridor technologies to improve operations along the roadway. Technologies include Variable Speed Limits, Queue Detection/Warning, Dynamic Junction Control, Flex Lanes, and Ramp Metering. Multi-modal improvements and proactive management of traffic signals along adjacent corridors are also part of the ICM Program. The first phase of the program will include installing Variable Speed Limits and Queue Detection/Warning along the roadway. These technologies target the safety concerns and daily incidents along I-76 by slowing down traffic and warning drivers of upcoming congestion and crashes on the roadway. Upcoming phases will include more complex, longer-term strategies including Dynamic Junction Control, Flex Lanes, and Ramp Metering. Throughout the duration of the program, PennDOT will be partnering with SEPTA and other regional agencies to make transit, bicycle, and pedestrian trips more available and desirable along the corridor.